A small 75 x 50cm Grey Turtle Mat with Multi-Grip back suitable for use on all floors and carpets. The Grey Multi-Grip Turtle Mat is a highly absorbent, dirt-trapping cotton pile mat designed to help keep all of your floors clean and dry by stopping dirt and wet before it enters your home, whilst the microfibres attract and hold dry dust and dirt meaning floors stay cleaner for longer. Built with the Anti-Slip Multi-Grip backing, it is designed for use on all floors and carpets. Unlike the Latex mats, the Multi-Grip mats feature square edges for that clean look. Just like any other Turtle Mat, it is made in the UK and is fully machine washable and can even be tumble dried. 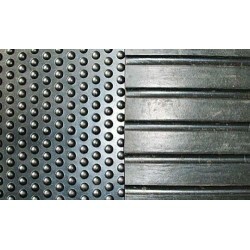 This doormat is dirt-disguising mix of black with gun-metal grey with square corners.